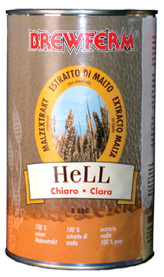 Highly concentrated (80 %) liquid, unhopped extract of barley malt. For "extract" brewing and mini-mash-method. Can also be used as a replacement for malt (use 75 % of the specified quantity) or as a replacement for sugar (replace 50 - 100 % of the sugar by 125 % malt extract). EBC 10.